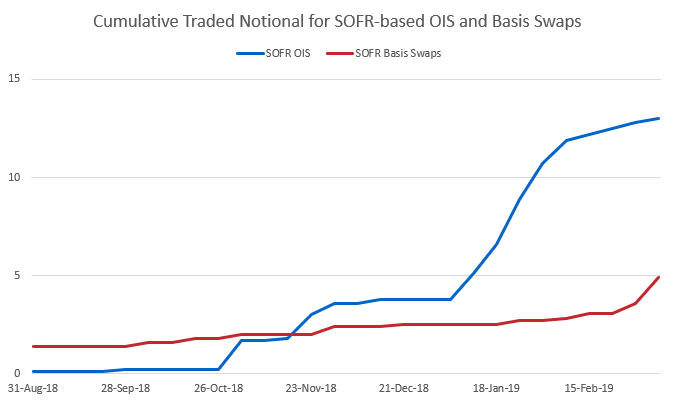 As part of our ongoing efforts to help you monitor the potential replacement of LIBOR and/or OIS by newly designated alternative reference rates (ARR), we have summarized the latest market activity for the ARR for USD LIBOR, SOFR. Further details about these market changes are available in our LIBOR Replacement Watchlist. You can also download this market summary. 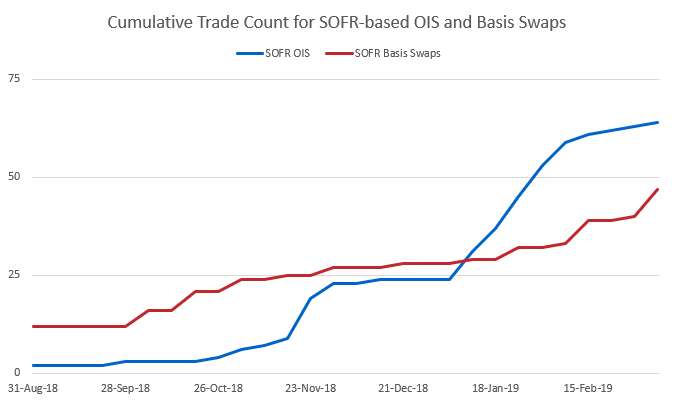 SOFR-based OIS trading grew significantly at the start of 2019 and both notional and trade count continue to grow for OIS and Basis Swaps. See ISDA Analysis for more details. SOFR futures trading also saw significant acceleration at the beginning of the year with OI increasing 42% in January. For more details, check out the latest SOFR futures recap from the CME. Likewise, SOFR debt issuances picked up pace considerably with a new monthly high of $16.4 billion issued in February. Total cash issuance is now at $70B from 19 different institutions. Principia Partners LLC (Principia) provides solutions for derivative and structured finance operations. Global financial institutions and independent asset managers have used the award-winning Principia Structured Finance Platform since 1995 to unify investment analysis, portfolio management, risk surveillance, accounting and operational control across the breadth of structured credit assets, fixed income investments and complex derivatives. In 2015, Principia launched its Analytic Service, pasVal, to make its award-winning pricing and analytics available to an even broader range of businesses. Principia is based in New York, with an office in London and a technology center in King of Prussia, Pennsylvania.